Proper care of your shuffleboard will guarantee you a great playing surface for years to come. Waxing and cleaning your board will preserve the quality of your playing service and prevent damage. Try to keep your shuffleboard from windows where there are greater temperature and humidity changes. Also, try to keep your shuffleboard table from direct sunlight which could discolor and dry out your table. Use Shuffleboard Cleaner/Glaze to remove all old powdered wax & shuffleboard silicone buildup on your table. Buff your table with a cloth, or Shuffleboard Board Wipe. Let stand for 15 minutes before playing. Apply Liquid Shuffleboard Wax. This prevents dry or dead spots. Wait for 30 minutes before playing. 1) Apply Shuffleboard Silicone spray before each game. Shuffleboard Silicone spray will cut down on your use of powdered wax. 2) Use your favorite powdered speed wax depending on table size and your desired degree of difficulty. Glaze/Cleaner – Removes dirt and grime. Leaves a fresh, clean glaze for a smooth fast finish. Liquid Wax – Provides a protective coating to your table for a smooth fast finish. It also prevents dry or dead spots. Silicone Spray – Provides a base after the liquid wax has dried, and before you use your favorite powdered wax. 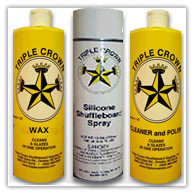 Triple Crown is formulated for Shuffleboard games and can also be used on Foosball & Stick Hockey Games. The Triple Crown Maintenance Kit can be purchased under the “Maintenance Kits” section. Sprinkle your favorite powdered wax on the table. 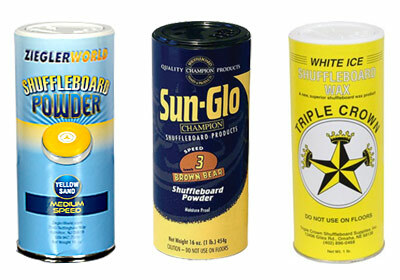 There are three major brands of powder wax – Triple Crown, ZieglerWorld and Sun-Glo. Each brand has different speeds of powder wax that vary the speed or control. For example, ZieglerWorld’s White Sand powder wax is super fast and made with pure silicone ball bearings. This powder wax is great for longer tables or for players who want a fast playing surface. ZieglerWorld’s Yellow Sand powder wax is the slowest speed wax. This wax is made of cornmeal and silicone – great for smaller tables or players who want more control. Each brand has varying speeds of wax so that you can customize your game. See our Wax Guide to see which brand and speed are right for you. Our Board Wipe is Specially made to keep your table clean and remove dirt, dust and old Silicone. Board Wipes can be purchased under the “Shuffleboard Accessories” section.